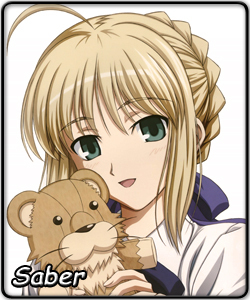 Name: Arturia Pendragon, referred to as "Saber"
Saber isn’t a citizen of Japan. Saber isn’t her true name; she isn't from modern times. But she has a wish she has to fulfill, no mater what. And as a knight of legend – a ‘heroic spirit’ – she is allowed to take part in the bout for the Holy Grail. Pledging servitude to a sorcerer, hiding her true identity behind the “class name” of Saber and fighting against other spirits like her, she is granted the chance to have any one of her desires come true. Desperate to correct a grave mistake of her past, Saber does not hesitate to take up the challenge. Paired up with a weak master who knows little magic and can’t supply her with mana, Saber is immediately placed in a disadvantageous position. Nevertheless, she shows great resolve and control, doing everything she can within her code of honor to improve their chances, while not begrudging her master his weakness. Although her calmness and dignity distance her from the contemporary image of a tsundere, it is nevertheless true that Saber’s behavior and attitude change over time, turning her from a cold and detached warrior into a more open and understanding companion. But will that be enough for her heart full of pride and regret to accept love? What's certain is that whatever happens, Saber will remain herself, a valiant and honorable knight. Still, even as we learn more about her feelings, past and true identity, one thing remains a mystery. While devouring all that food, how does she retain her grace?